One of the big reveals at this year’s Consumer Electronics Show happened yesterday, before the show’s official Jan. 5 open. And with Tesla Motors Inc (NASDAQ:TSLA) stock down 1.5% today, are Tesla’s shareholders getting the heebie-jeebies? Faraday Future, the mysterious electric car startup that showed off a non-functional concept car at last year’s show was back. This time the company had the Faraday Future FF 91, a working, ultra-fast electric car that demonstrated its autonomous parking capability, while boasting a slew of class-leading features. At CES 2017, Faraday Future showed off its new FF 91 electric vehicle. One prototype was shown parking itself in downtown Las Vegas via a live video feed. A second unit onstage performed a similar stunt. The vehicle packs an incredible 1,050 horsepower in its electric motors with high-density battery packs good for a class-leading 378-mile range. Bluetooth integration, a smartphone app and facial recognition cameras are key to everything from opening the doors to learning driver preferences. The Faraday Future FF 91 is equipped with more than 30 advanced sensors for autonomous driving, including cameras, radar, ultrasonic sensors and a retractable Lidar unit. The comparisons to Tesla and its current line-up of premium electric vehicles showed that Faraday Future is hoping to steal some thunder — and some customers. Faraday Future claims its new car has the densest battery pack available, with 130 kilowatt-hours of energy. Tesla meanwhile, just introduced a 100 kilowatt-hour battery pack in August, an optional upgrade to the 90 kilowatt-hour pack offered with the Model S starting in 2015. The higher density battery pack means the Faraday Future FF 91 gets superior range (378 miles compared to 315 miles for the Tesla) and faster speed. Faraday is also promising wireless charging is coming at some point. 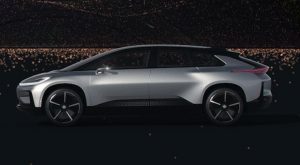 The Faraday Future FF 91 was pitted directly against a Tesla Model S and Tesla Model X in a race (which concluded offstage and wasn’t independently verified). The Faraday Future FF 91 won, boasting a supposed new production car speed record of 0 to 60 mph, at 2.39 seconds. The Faraday Future FF 91 was at least a working automobile — unlike last year’s stationary display model — but it’s not quite ready for prime time. There were glitches, including an embarrassing moment when the car refused to start moving on stage during a self-parking demonstration. Jalopnik also noted assembly flaws and a reluctance to show the interior of the car, signs that the Faraday Future FF 91 isn’t yet production-ready. If the company survives to begin production, as Business Insider pointed out last year, the mere existence of Faraday Future can be seen as a boost to TSLA by adding to the electric car momentum. Additional players increase the odds that the overall electric car industry will survive its startup phase and thrive, something that is obviously good for Tesla. And from the appearances of the Faraday Future FF 91, the company is currently aiming at a premium market, while Tesla is pinning its future on mass production of the affordable Model 3. Car lovers with deep pockets can now reserve an FF 91 for $5,000 — and yes, the deposit is refundable should things not work out. The actual sales price was not announced. The bottom line? With the Faraday Future FF 91 demonstration at CES 2017, Faraday Future came a big step closer to having an actual product to sell. But the company is struggling, the prototype was imperfect and even if it does get its act together, it seems to be focused on the high end luxury market. Tesla shouldn’t be sweating too much over this competition. Article printed from InvestorPlace Media, https://investorplace.com/2017/01/tesla-motors-inc-tsla-stock-faraday-future-ff-91/.